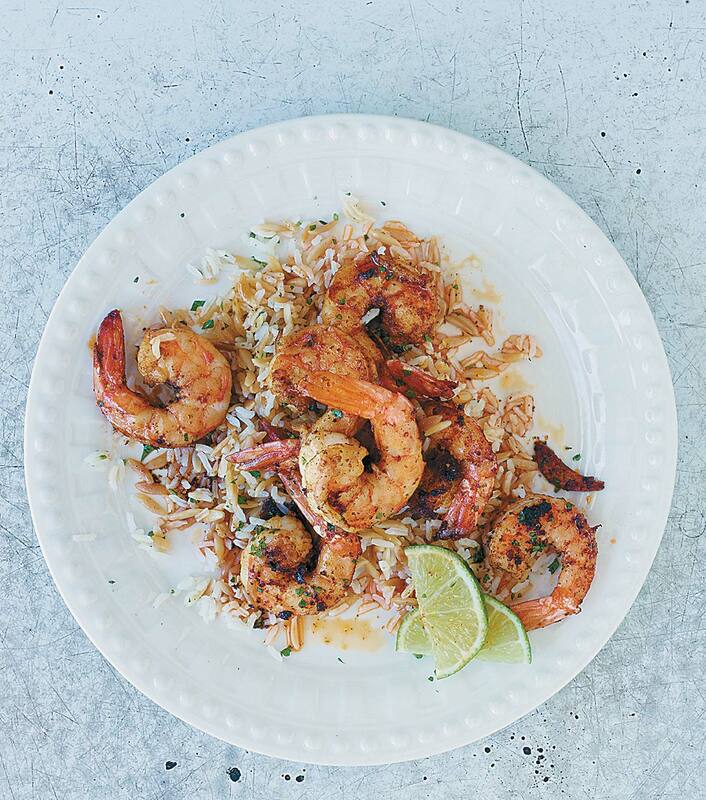 This sauteed shrimp recipe is easy, healthy, and on the table in 15 minutes. Even better, it’s spiked with just the right amount of spice to intrigue but not overwhelm. “Be prepared.” Isn’t that the motto for both the Boy Scouts and the Girl Scouts? It’s also the motto for classically trained French chefs, although they express it as “mise en place,” which translates literally to “put in place” but essentially means “be prepared.” It simply means to look ahead and know what you’ll need and to be ready. This is relevant because being prepared in this sense of the term makes this already easy recipe even easier. See, when you saute shrimp, it’s a quick-cooking technique. If you don’t read the recipe through first and prepare everything you’ll need and have it alongside the stove before you start cooking, you’re going to end up taking precious moments to accomplish that once the shrimp are already in the skillet, which means you’re going to be distracted, which in turn means you may inadvertently overcook your pricey shrimp, and that would truly be a shame. So be prepared! It takes but a few minutes to do before you begin the recipe and it saves you apologies and disappointment galore at the table. 1. Pour the oil into your largest skillet, preferably one that’s at least 12 inches in diameter. Place the skillet over medium heat, toss in the garlic, and let it warm until the oil shimmers and the garlic is softened, at least 2 minutes. You want to be careful to not let the garlic turn brown or it will taste scorched. 2. Sprinkle the paprika, smoked paprika, cumin, ground chipotle, 1/2 teaspoon salt, and 1/8 teaspoon pepper into the skillet and stir. Increase the heat beneath the skillet to medium-high. Add the shrimp in a single layer and cook, without stirring, until they just barely turn pink, about 3 minutes. (If the shrimp don’t fit in a single layer, then divvy the oil and shrimp between 2 skillets and cook them at the same time.) Flip the shrimp and cook until they’re just barely opaque throughout, about 2 minutes more. Be careful not to overcook the shrimp. 3. Immediately remove the skillet from the heat. Dump the shrimp along with its oil into a serving dish, sprinkle with the parsley, and squeeze on the lime or lemon juice or simply set the citrus wedges on a plate and pass on the side for each diner to squeeze to his or her heart’s content. Serve right away. A smoky twist on a simple garlicky shrimp dish, this little beauty of a recipe is easy, versatile, and even pretty to look at. Served over a millet-cauliflower mash (remarkably like grits! ), the sauteed shrimp felt Cajun, but I can see it easily adapting to Latin or Spanish menus. My grocery had slightly smaller shrimp (21/25) on sale. No sweat; the author's visual descriptions of when to flip worked great. However, I thought my 10-inch skillet counted as large but next time I'll use the 12-inch skillet and really be able to see what I'm doing. Be sure to have your plates ready and waiting! The shrimp cook in a flash. Toss with parsley, squeeze some citrus (lemon for me), and tumble them onto your plates, divvying up the smoky red sauce. So good! The 1/4 teaspoon chipotle powder yielded a pleasant heat, nothing searing. I used lemon. It's helpful to ready all your other ingredients near the stove as cooking goes quickly and is hands-on. Use an EXTRA large skillet if you intend on cooking in a single batch, single layer. Serves 4 generously. This sauteed shrimp recipe delivers as promised. The shrimp are smoky, spicy, moist, and tender. Be careful with the garlic. Because it's thinly sliced, it will cook and soften in about a minute over medium heat. After it softened, I found it helpful to add a few tablespoons of water to the pan to stop the garlic from cooking and possibly burning. I used freshly squeezed lemon juice rather than lime since that was what I had on hand. I served this with polenta, which was a perfect accompaniment. This sauteed shrimp recipe was easy to divide in half for two people as well as simple enough to cook and get on the table. Add to that, it is delicious and full of flavor. A real winner. Watch your slices of garlic. My slices started to get very brown very quickly. I had to turn the heat down immediately. The oil was very hot, and I did not want my garlic to burn. I actually held the frying pan up, off of the burner and swirled it to get the oil moving. My garlic cloves cooked beautifully, without even being on the burner. Have your spices measured out altogether in a little bowl. You can just dump them all in together once your garlic slices are brown. Have your peeled and deveined shrimp nearby and add to the frying pan. I did this with my fingers, going around in a circle, putting them in, one-by-one. Once I got them all in, my shrimp only needed 30 seconds before I started to turn them over. I started with the shrimp that I had put in first, and then went around in a circle, follow the path in which I had put them in. by the time I had gotten back to the beginning, I was just about ready to start taking them out. I took out the first shrimp to check for doneness. It was done, so I removed them in order. All were done perfectly. I had smooth, silky, leftover mashed potatoes which I made a bed of to serve the shrimp over. The olive oil (again half a recipe’s worth), made for a lot of “sauce.” I think that I might cut back on the olive oil next time. Although absolutely delicious, it felt a bit too much. My Italian parsley had seen better days, so I sprinkled chopped cilantro over our dishes. Fresh lime juice sprinkled over the dish made for a perfectly delicious meal. This just made enough for my husband and I with some grits. We thought the recipe was delicious. I tried making a salad dressing with the extra olive oil I had leftover from the sauteed shrimp. It was a novel use, which was delicious in it's own right. 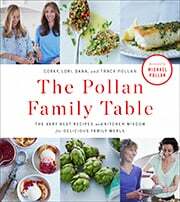 Sauteed Shrimp Recipe © 2014 The Pollan Family. Photo © 2014 John Kernick. All rights reserved. All recipes and photos used with permission of the publisher.